My jeepney ride today had been a test of patience. I got to ride in a jeepney where the driver is an old man who’s having a hearing problem and basically doesn't want to drive in a faster speed. 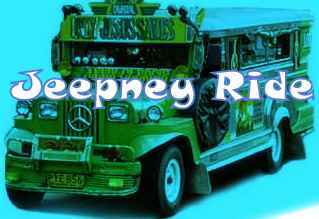 Usually when I ride a jeepney, I want to sit at the back of the driver. I like it there because it is the spot where my hair wouldn't be blown away easily and I don't have to move to the left or right to give space to other passengers. The only disadvantage in this spot is when there is no "konduktor" or fare collector, you are obliged to pass the fare fee from the passengers towards the jeepney driver. So I sit on my favorite spot at the back of the old driver who doesn't have a "konduktor". Aside from passing the fare I also have to relay the passenger's route info because the driver can't hear clearly what they are saying. Also, from time to time I am looking at my watch because I am going to be late with the slow speed of the jeepney.Well, it is the slowest ride ever but I ride with patience and arrived at my destination still looking forward for a great day. On my way to work, the jeepney I had ride with this morning was full of durian fruits. Durian is very much common in Davao. Some dislikes it for its strong odor but others like it for its delicious taste. It is a fruit that has many spikes on it that it is very much laborious to harvest. Anyways, the jeepney I rode into had been contracted to transport the durian fruits from the farm to the city market and picked up passengers along the way. So,with the jeepney full of smelly durian fruits and half an hour of travel, I arrived at my destination with smelly durian odor and graving for durian fruit. Well, another jeepney ride experience.